Pièce1991.028 item 283 - Gage Park, Brampton, Ontario, Canada.--10. Pièce1991.028 item 286 - 1093. The Park, Brampton, Ont. Pièce1991.028 item 287 - "Wilholm", Main St. North Brampton, Ont. Pièce1991.028 item 288 - Queen Street looking North, Bolton, Ontario.--2. Pièce 1991.028 item 286 - 1093. The Park, Brampton, Ont. Anglais » 1093. 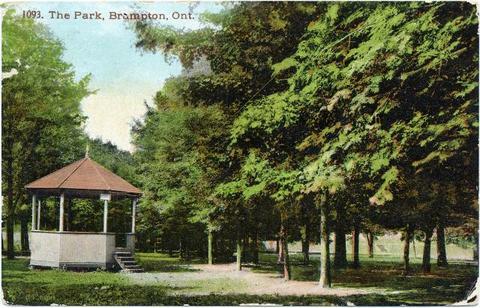 The Park, Brampton, Ont.